As a musician, we know you’d rather be in the studio than cooped up in your room tweaking the discography page of your band’s website. 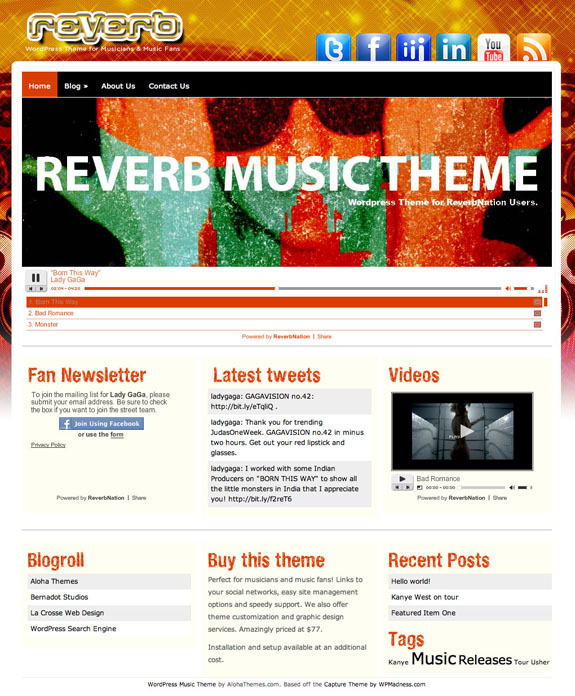 Because we care, we offer you the Reverb premium WordPress theme. It is part of a totally new series of premium layouts that AlohaThemes has put together with Reverb constituting the inaugural release. This new series is built on the Captive infrastructure with the permission of WPMadness. Ultimately, Reverb theme will provide you with an intuitive, easy-to-use WordPress layout that will have your band “live” in minutes.